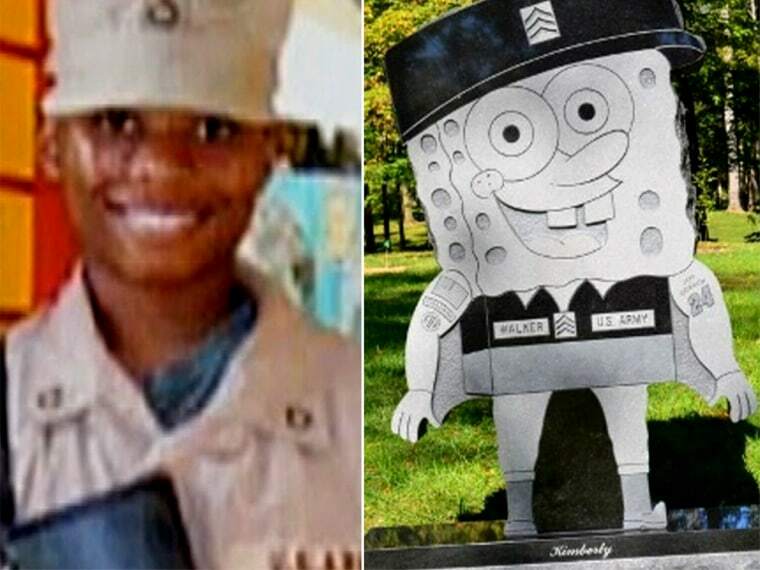 The family of an Army veteran allegedly slain by her boyfriend in February wants to honor her the best way it knows how — with a giant SpongeBob Squarepants headstone. The family of Army Sgt. Kimberly Walker received approval from a Cincinnati cemetery for a pair of 6-foot-8-inch-tall, 7,000 pound monuments of her favorite cartoon character. However, a day after they were put at Walker’s gravesite on Oct. 10, they were hauled off by the cemetery. The family spent $26,000 for the two SpongeBob Squarepants granite headstones to honor Kimberly and her twin sister, Kara, who serves in the Navy, but now is in a dispute with the cemetery after it withdrew its approval. The cemetery has apologized but says it will not reinstate approval. Walker, 28, had survived two tours of duty in Iraq before she was found beaten and strangled to death in a Colorado hotel room on Valentine's Day, according to court records. Her boyfriend Montrell Mayo, also a soldier, has been charged with first-degree murder in connection with her death. A huge SpongeBob Squarepants fan, Walker had a SpongeBob birthday party every year and her bathroom was outfitted with SpongeBob curtains. There is another SpongeBob Squarepants-themed headstone at a cemetery about an hour away from Spring Grove at the grave of 5-year-old Camden Fairchild. “We picked out the headstone and monument and size and everything before we contacted the cemetery and never had any friction,’’ Camden’s father, Billy Fairchild, told NBC News. The Walker family bought six plots at the cemetery to accommodate the large monuments. Kimberly’s personalized headstone also features American flags, Army uniforms and the Number 24 in honor of Jeff Gordon, Kimberly’s favorite NASCAR driver. Cemetery officials met with the Walker family on Tuesday in hopes of reaching a compromise. "We again apologized for our error and voiced our commitment to find a resolution," said Gary Freytag, Spring Grove's President and CEO, in a statement. The cemetery offered "several proposals" to create alternate headstones for Walker that would incorporate SpongeBob imagery, but no solution was reached. "The family reiterated their desire to have the monuments re-installed as is, but agreed to consider our proposals," Freytag said. "Spring Grove remains hopeful that a mutually agreeable compromise can be reached."